Dharma-character school (Chinese: 法相宗 pinyin fa xiang zong) is the pejorative name for a stream of thought that represented the Indian Yogācāra system of thought in East Asia. Its proponents preferred the title Consciousness-only school (Chinese 唯識, pinyin wei shi, also romanized as wei shih). The movement that would eventually receive these names was initiated in China by Xuanzang(玄奘), who, on his return from China, brought with him a wagonload of the most important Consciousness-only texts. These, with government support and many assistants, he translated into Chinese. 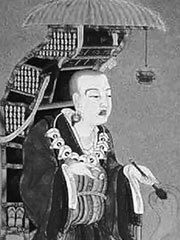 His disciple Kuiji (窺基) wrote a number of important commentaries on the Consciousness-only texts and further developed the influence of the school in China. The Faxiang teachings were transmitted to Korea (Beopsang) and Japan (Hossō), where they made considerable impact. Although a relatively small Hosso sect exists in Japan to this day, the original tradition has all but died out as an independent sect. However, its Consciousness-only teachings made a major impact on the native East Asian traditions that would later develop, most notably Tiantai, Huayan and Chan Buddhism.